To keep myself from getting bored I tend to work on whatever looks interesting at any given time. I didn’t have a lot of time yesterday (5/10/08) because I had to install an old Blaupunkt ‘Frankfurt’ in my wife’s 1972 Fiat 124 Sedan Special and I’m not the best at this sort of thing to begin with. It turned out the dial on the tuner was broken so I had to open up the deck and find stations using a tiny screwdriver to move the guts around then set the mechanical presets with it energized, scary. Now she has 5 choices to listen to and a DIN plug to run an Ipod into. Point of all this: I expected to have at least 2 hours to work on the SS, I ended up with 45 minutes. When rummaging around looking for stuff to help with the stereo installation I came across the rear brake adjusters in a big zip-lock bag. I poured them out on the bench and squirted them with some WD40 I had on hand. These Girling units are the same as those found on the first few years of Austin Healey 100/3000 roadsters and probably a lot of other stuff that I don’t know about. I wipe down my work bench, get the couple of tools I will need to take them apart and clean them together and get to work. I need two for my SS but the bag has 4 in it and I might as well do all four at once, preserving the last two for the next project. 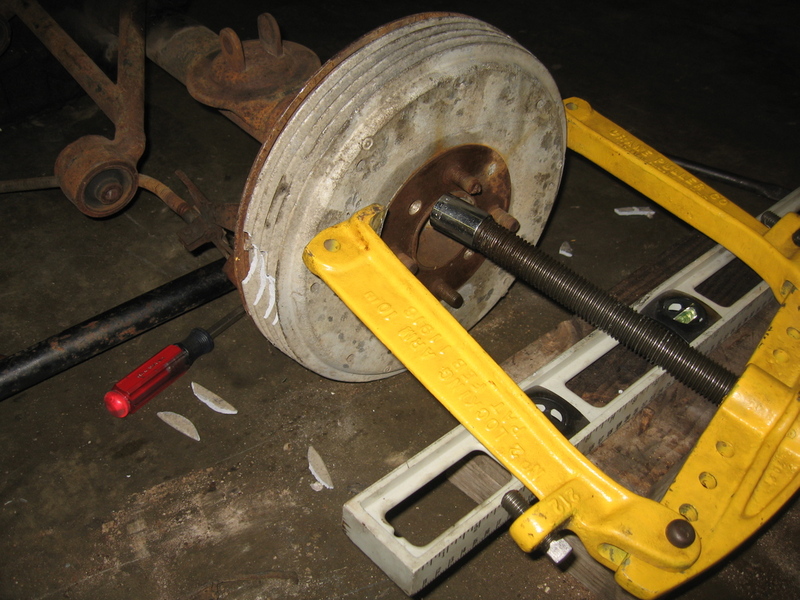 The center shaft with the square drive is the adjuster, turn it clockwise to adjust the brake shoes out, anti-clockwise to adjust them in. 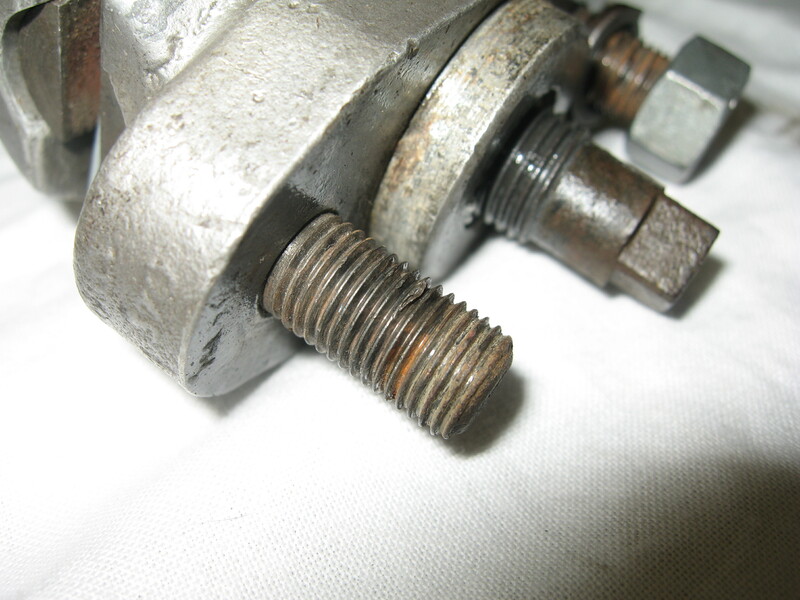 The damaged threads can be seen about 6 turns down on the nearer stud. It’s official kids, I’m back on the SS. I bought a CAD plating kit today online from Caswell, ordered a set of tail light base and lens seal gaskets from Velocespace, requested a price quote for a new set of door latch buttons, a rear view mirror and some interior handles from Afra, and made a list of engine parts I still need to buy from Centerline. The gentle approach to removing drums involves tapping and pulling with your hands. That is followed by prying and hammering. Prying and hammering gives way to a big puller and when the fins start to break you call it a day and think about it until your next day at the shop. Today was that next day at the shop for me. Picture above is what it looked like today when I started. Brakes #3: The SS Master Cylinder part 1. I was moving stuff around my space and cleaning up on Sunday trying to organize the parts for my various concurrent projects when I came across this master cylinder that I set aside for use in the SS. It was under some stuff in a plastic bag from when I took it to Glenn’s shop to get help removing the big end nut. I hadn’t opened it so I figured it was a good time to peek inside to see if I need to look for another. Next thing I knew I had spent an hour cleaning it. Some rust and crust can be seen here, but I don’t think it’s too bad. I pulled the seal and that weird washer that allows flow through the array of holes under the seal out and set to work with various implements to clean it up. The rear brake plates on an SS are the same as those on a Sprint Veloce. The gas tank capacity on these cars was increased by growing it in the direction of the differential so that it effectively surrounds the aluminum differential housing. To accommodate this, the emergency brake actuators had to be relocated so that they were in front of the rear axle assembly. Many other parts besides these backing plates changed, but I will go into those changes later when I talk about the emergency brake assembly as a whole. Important to the backing plates is that the new emergency brake actuation was via a single cable that was pulled from the center through a perch, and each end of the cable was secured to the backing plate by a welded on bracket. My SS was missing the correct backing plates but Alfa Parts Exchange, a local Alfa wrecker, had a set still attached to a Veloce rear end. I bought all the emergency brake parts they had. One of the brackets on the backing plate was broken off but included and had to be welded, and both had major rust pitting. I spent an hour and blasted the plates to remove as much rust as possible. One of my friends at my shop was doing some welding so I had him weld the broken bracket back into place while he was at it. After the repair I painted them with POR 15, followed by a primer then a coat of epoxy based appliance paint. 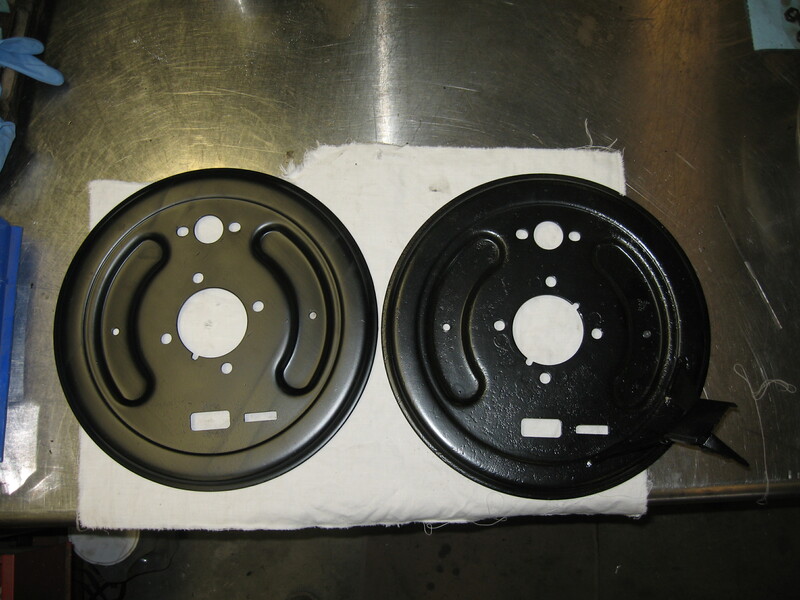 The plate on the left is a standard Giulietta part and the plate on the right is the modified Veloce part.